Is there a better alternative to MacEtegami? Is MacEtegami really the best app in Image Editing category? Will MacEtegami work good on macOS 10.13.4? 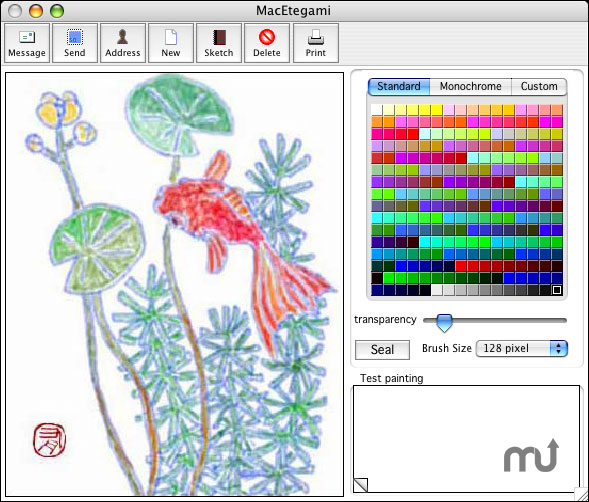 MacEtegami is a watercolor painting simulation program. You can easily send e-mail attached your picture by Mail.app. etegami means a post card painted a picture and drawn message in Japanese. It is usually painted a picture with watercolors. Version 2.03: Release notes were unavailable when this listing was updated. MacEtegami needs a review. Be the first to review this app and get the discussion started! MacEtegami needs a rating. Be the first to rate this app and get the discussion started!